The Irish people since their conversion to Christianity have possessed a particularly strong devotion to the Blessed Virgin Mary—a devotion they received from St. Patrick. Through many centuries of persecution the Mother of God’s intercession has assisted and comforted the Catholic people of Ireland. The Irish suffered greatly for the one, true Catholic Faith, but in the 19th century they encountered especially bleak times. True, in 1829 the Catholic Emancipation Act officially ended persecution against Catholics, but persecution against Catholics in Ireland persisted. In the 19th century, Ireland experienced potato crop failures several times, including the great potato famine, along with a deadly epidemic of typhoid fever. While the Irish and their children were starving, Catholics were bribed with the promise of food or money if they would apostatize from the ancient faith. With great heroism, most of the Irish Catholics kept the faith. Mary Immaculate, Cause of our Hope, helped to sustain the persecuted Church in Ireland. On the rainy evening of August 21, 1879 in the west of Ireland, in Cnoc Mhuire (Knock in English), located in County Mayo, a tremendous prodigy occurred. Several people noticed that a bright light shone over the church of St. John the Baptist and that three figures appeared near the south gable of the church. Fourteen witnesses from six-year-old John Curry to seventy-five-year-old Bridget Trench, saw the apparition. Another person observed the bright light over the church from half a mile away, but did not come to the church to investigate the light. Whom did the witnesses see? They saw the Blessed Virgin Mary wearing white garments and a brilliant golden crown with a rose under the crown on the forehead. She was prayerfully raising her hands and eyes to heaven. St. Joseph was at Mary’s right with his head respectively inclined toward Mary. St. John the Evangelist was to the left of Mary, vested as a bishop, his left hand holding an open book and his right hand raised as in preaching. To the left of St. John, a cross and a lamb were on top of an altar. The figures were bathed in light and “stood” about two feet above the ground. They sometimes receded toward the gable and would then come back again. The witnesses watched the apparition in the pouring rain for approximately two hours while reciting the Rosary. Though it continued to rain heavily all during this time, no rain fell towards the gable, on the figures, or on the ground beneath the figures. Shortly after the apparition occurred at Knock, both pilgrimages and miracles began. Ten days after the apparition, a small girl received the cure of a painful ear condition that had left her deaf, when her parents made a pilgrimage to Knock with her. 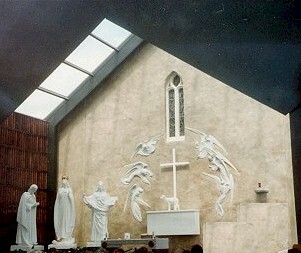 In 1979 (the centennial year of the apparition), His Holiness John Paul II made a pilgrimage to the Shrine of Our Lady of Knock. There are at least two unusual features of the apparition at Knock. Our Lady, St. Joseph and St. John kept silent. Mary delivered no verbal message: no reproof, no warning, no request, nor even a word of comfort. But her silence spoke eloquently enough. Mary stood in silent solidarity with the greatly oppressed and suffering Irish people. Further, the celestial figures’ silence in the presence of the Eucharistic Lamb indicates the kind of reverence that the faithful should render the Eucharistic Lord. The other distinctive feature of this apparition is that so many people, and of all ages, witnessed it. Mary appeared at Knock on the vigil of the feast of her Immaculate Heart to remind the Irish that they were close to her Heart and to encourage them to persevere in the faith. She came as the Queen of Heaven and Ireland to remind the faithful of the grace and hope which comes from her Son and the perpetual Sacrifice of the Mass. Our Lady of Knock came with St. Joseph and St. John to teach all of the faithful the importance of reverential prayer and of sacrifice, especially when united to the Eucharistic Sacrifice of Our Lord Jesus Christ.